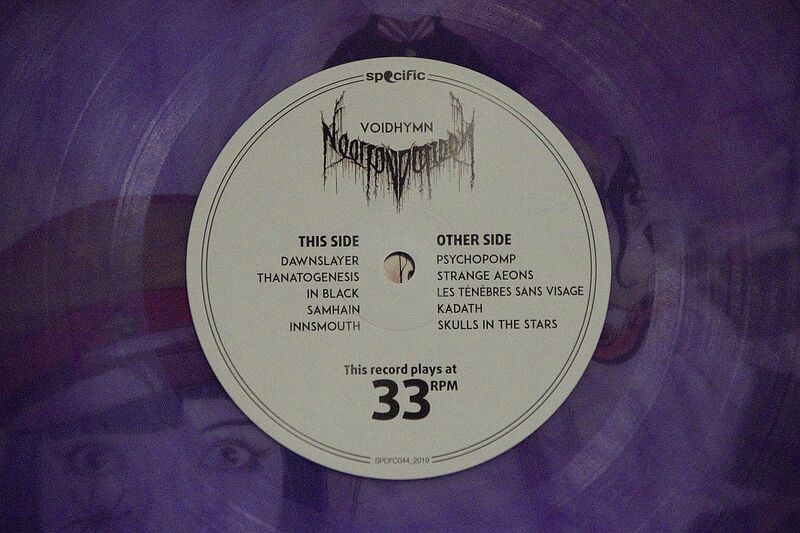 Taking a look at the upcoming Specific Recordings release of NECRONOMIDOL’s “VOIDHYMN” on vinyl. Today on the site I have something a bit different than my usual musical musings. A bit of a surprise if you will. I mean, I was definitely surprised when the email landed in my inbox and then again when the product I’m going to be…reviewing (that sounds so weird somehow) today landed on my doorstep. The haste in which it was delivered was also a pleasant departure from the norm, so who says the French and the British can’t get along. Well, our postal services can at least. Of course I’m going to be talking about the vinyl release of NECRONOMIDOL’s most recent album “VOIDHYMN” if that wasn’t obvious enough by the title up there. Once again they’re teaming up with the fantastic Specific Recordings out of Metz, France for the pressing and the lovely folks from the label were kind enough to hit me, and presumably several others, up with the offer of a promo copy. I jumped at the chance because 1. I love free things and 2. I was going to buy this anyway, so I guess I came out way ahead on this in the end. You guys still have to wait 3 weeks while I already have the record in my hands, aren’t I a lucky guy? That aside, the point of this article is just to give my impressions on the product itself really. I’ve already reviewed the album here if you’d like to check that out in your own time but needless to say I enjoyed it quite a bit. I’m looking forward to hearing it recreated on wax here and if it’s anything like past NECRONOMIDOL vinyl pressings then I have very high hopes. I’ll also chat a bit about the packaging, the vinyl colorway and stuff like that while showing off some pretty decently taken and edited photos if I do say so myself. Huge thanks once again to Specific Recordings for hooking me up here. They did so without any direction or expectation as to what I’m going write next, so disclaimers and all that fun stuff. Then again, they don’t have to do stuff like that because their high quality usually does all of the talking for them. Let’s see if that remains the case here, shall we? 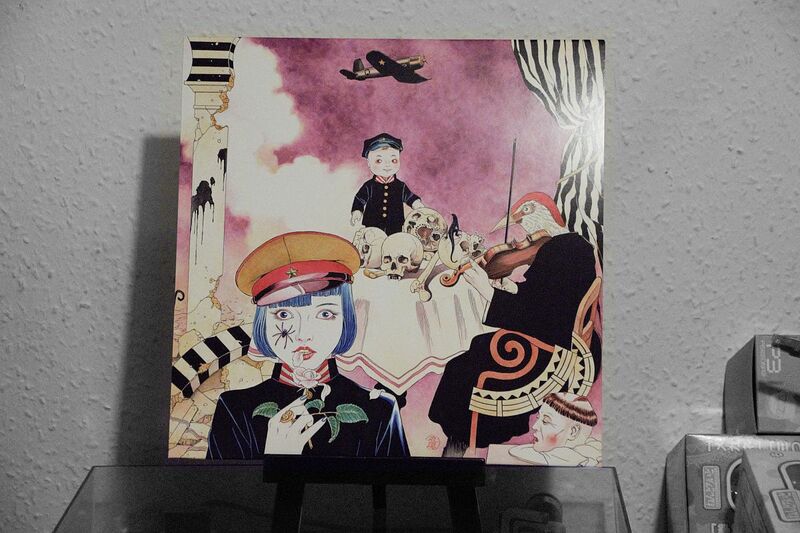 The first thing you notice about the record is the absolutely stunning Suehiro Maruo artwork that adorns the front cover. Rendered in full for the vinyl release, this is what I would call a statement piece. Raise your hand if you’ve never bought a record just because it had a cool cover. That’s what I thought. 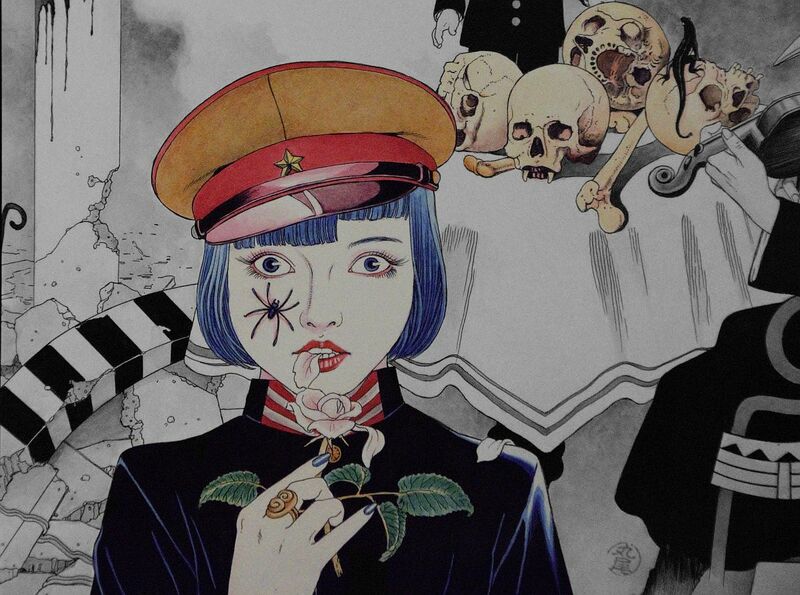 If it was up to me, Suehiro Maruo would be making the covers for everything that NECRONOMIDOL puts out but I imagine that could get pricey so I’m all the more appreciative when his artwork does end up gracing the cover of a Necroma release. Simply wonderful stuff, if you’re into that kind of thing at least. The back of the jacket seems a little plain by comparison, but I can appreciate a straightforward design that tells me important things I need to know, like the tracklist for example. 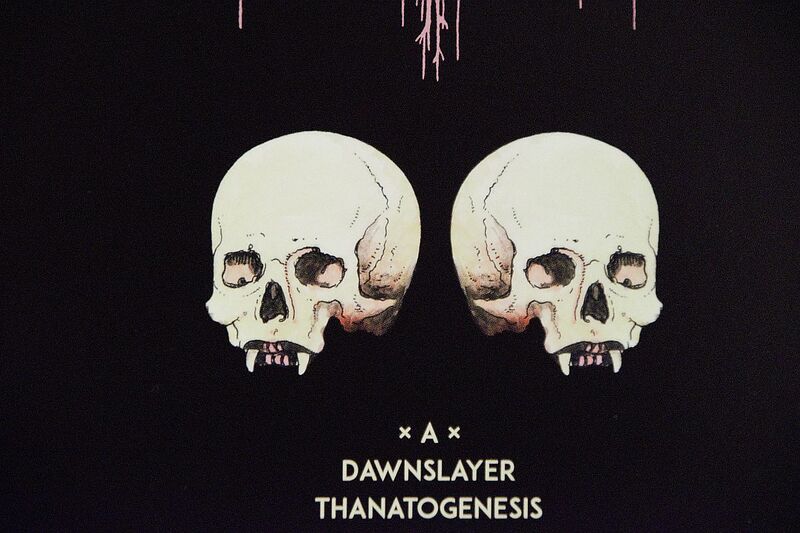 The album title and NECRONOMIDOL logo are depicted in a soft pink/purple tone while said tracklist gets treated to a bleached bone hue to match the very simple but impactful skull design resting above it. While some might wish for the wrap-around jacket design that’s fairly popular these days I think this looks very clean and well laid out. Party in the front, business in the back…that’s how the saying goes, right? Which brings us on to the record itself, you know the most important thing in the equation. 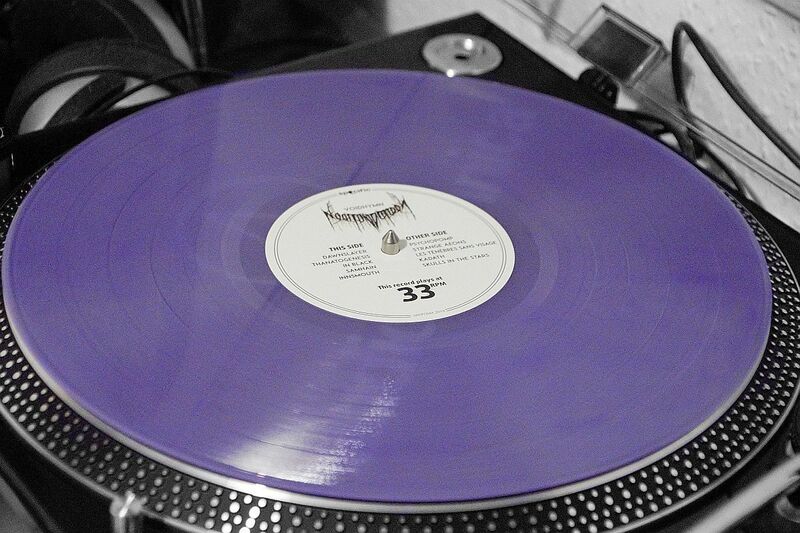 Pressed on what Specific are billing as “clear & purple 180g vinyl”, in person the record looks to have more of a lavender tone than the very rich purple seen even in my photographs. I suppose it depends what sort of light you’re looking at it in. Either way, the color is very appropriate for the release and at least on my copy looks to be very consistent throughout. The labels show the NECRONOMIDOL logo and tracklisting on the a-side and the Specific Recordings logo on the b-side, both of which look very clean in design once again. Quality stuff. Finally the most important thing of all, how does it play? Well, I don’t claim to have the most expensive, enthusiast setup in the world but the record sounds immense on my modest, slightly up from beginner kit (an Audio Technica LP120 usually outputting to a FiiO E11K headphone amplifier so I don’t get evicted). The guitars are dense, the drumming thunderous and the vocals clean and hitting all of the right notes. You can tell a lot of care went into mastering this album for the vinyl release, something that labels don’t always get right so you gotta acknowledge it when they do. Bottom line, I think anyone with an anywhere near decent deck and speaker/amplifier setup should get hours of enjoyment out of this release. 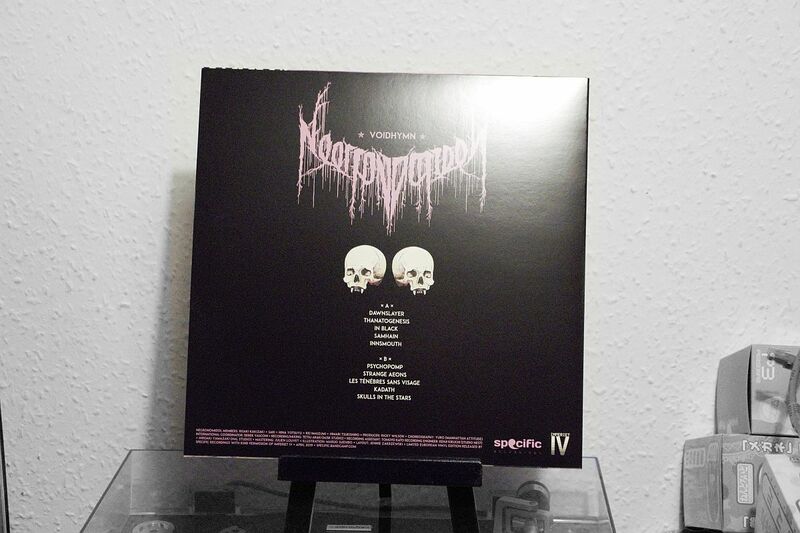 So there you have it, “VOIDHYMN” by NECRONOMIDOL on vinyl thanks to the efforts of the fine folk at Specific Recordings. You can pick the record up starting April 26th on the Specific Recordings Bandcamp. 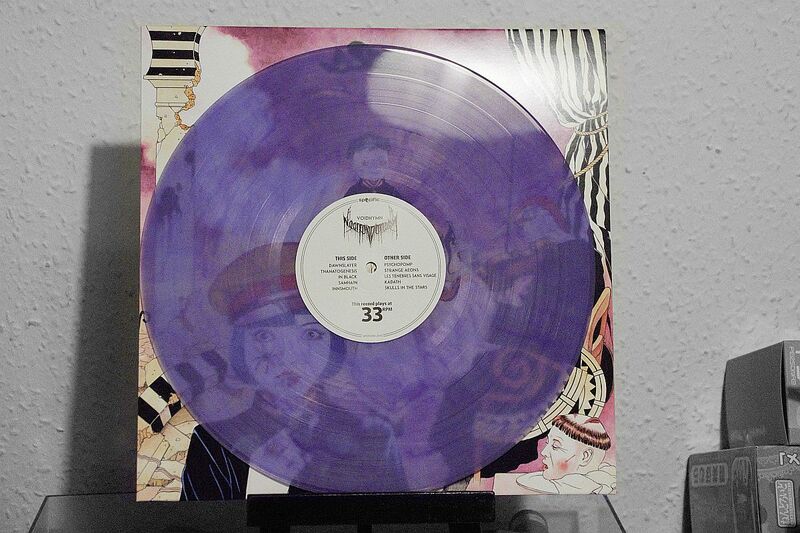 No pre-orders, strictly limited to 500 copies on purple and transparent wax and if it’s anything like last time these things are going to go quick. Easily worth the purchase in my opinion so make sure you mark those calendars. You can follow Specific Recordings on Twitter @SpcfcRecordings for more news on upcoming vinyl goodness. Also be sure to follow NECRONOMIDOL on Twitter @NECRONOMIDOL if you haven’t already and look forward to more information on their European tour this summer coming soon (hopefully). I know I’m excited for that, they’re practically playing a show in my backyard which is totally crazy to me.